Seniors order your Cap & Gown now! Purchase your ticket now for PTSA Auction! 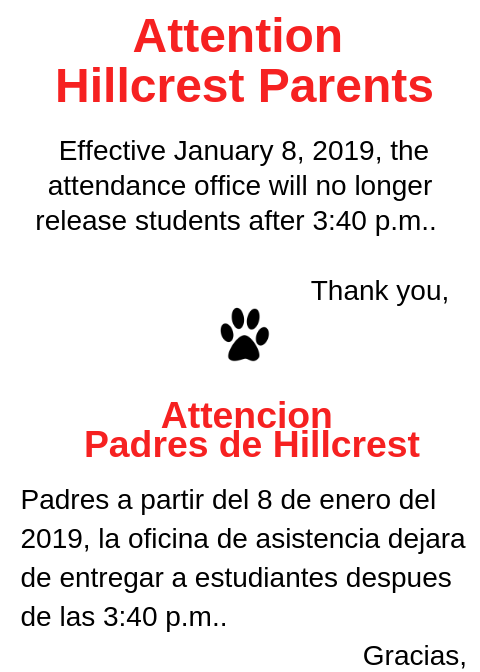 Parents effective January 8, 2019, the attendance office will no longer release students after 3:40 p.m..
Padres a partir del 8 de enero del 2019, la oficina de asistencia dejara de entregar a estudiantes despues de las 3:40 p.m..
CLICK HERE TO CHECK OUT HILLCREST ON FACEBOOK! A learning platform designed to provide educators, administrators and learners with a single robust, secure and integrated system to create personalized learning environments. The Hillcrest IB programme has filled all slots for the class of 2023. Would you like to see all that Hillcrest has to offer? Fill out a request form here for a campus visit!! Collegiate Academy 2019-2020 Online Application! Schedule a shadow day to visit Hillcrest Collegiate Academy! Sign up for the Academy of Engineering!